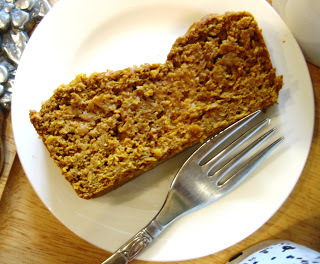 For a healthy alternative to breakfast bread, dessert cake, or just a snack, try this sweet potato protein loaf. Sweet potatoes, are already high in fiber and other nutrients. Added to this are flax, wheat germ, and Scottish oats (also fiber-rich). The sugar, though not too sweet, needs a protein balance: whey protein powder. Preheat oven to 350 degrees. Prepare a loaf pan with cooking spray and dust with flour to prevent sticking. Set aside. This bread is mixed by hand in one large bowl and super simple to put together. In a large mixing bowl add blended sweet potato and organic coconut sugar, stir until well blended and sugar lumps removed. Add blended eggs. Stir in the vanilla. Set the coconut oil aside and save for last add in to ensure it does not solidify when added to mix. Add the dry ingredients on top of the wet ingredients in the same bowl and stir until well combined. Add the liquid coconut oil, and slowly stir until well combined. Pour batter into prepared loaf pan. Bake for approx 35-45 minutes (start checking at 35 minutes) or until a knife in the center comes out clean. Let cool in the loaf pan for 8 minutes and turn out onto a wire rack. Enjoy this for breakfast, dessert, or snack!